Landslides and steam emissions on Wurlali volcano were triggered by MM IV-V earthquakes near the [island]. About 4,000 people fled the area, and one of the evacuees died of shock. Staff from VSI observed small landslides and cracks in house walls. There was no volcanic activity observed following the landslides, but the usual white plumes continued to rise 30-50 m above the crater. Tectonic earthquakes were continuing at rates of 14-32/day on 8 February. The Global Volcanism Program has no Weekly Reports available for Wurlali. Wurlali volcano, also known as Damar, is the SW-most historically active volcano in the Banda arc. 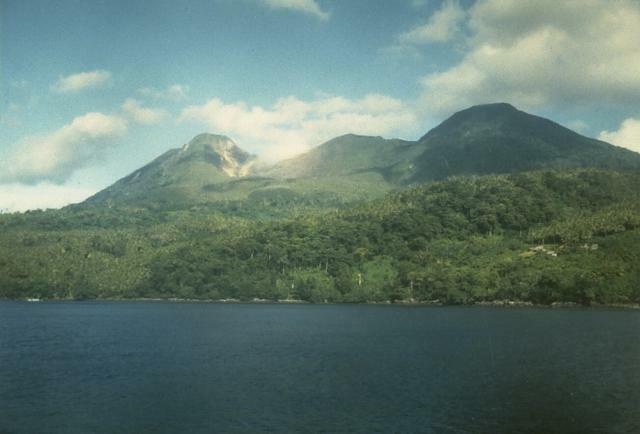 The andesitic stratovolcano was constructed at the northern end of a 5-km-wide caldera on the eastern side of Damar Island in the Banda Sea. Fumarolic activity occurs in the twin summit craters and on the SE flanks, producing exploitable sulfur deposits. An explosive eruption in 1892 is the only known historical activity. There is no Deformation History data available for Wurlali. There is no Emissions History data available for Wurlali. Wurlali volcano (also referred to as Damar), seen here from Cape Wilhelmus on the north, is part of Indoneisia's Banda Island chain. The 868-m-high stratovolcano was formed in the northern part of a 5-km-wide caldera, and has twin summit craters. During historical time only a single explosive eruption occurred, in 1892 from the summit crater. Photo by K. Sumaryano, 1994 (Volcanological Survey of Indonesia). 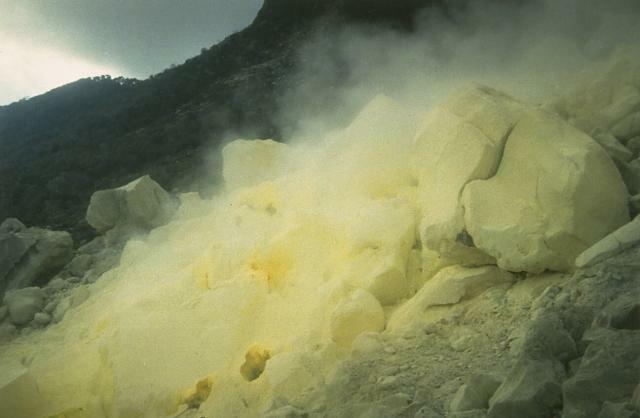 Steam issues from the sulfur-encrusted Wurlali fumarole field, which is a source of sulfur extraction. Fumarolic areas at Wurlali occur in the summit crater and on the SE flank. 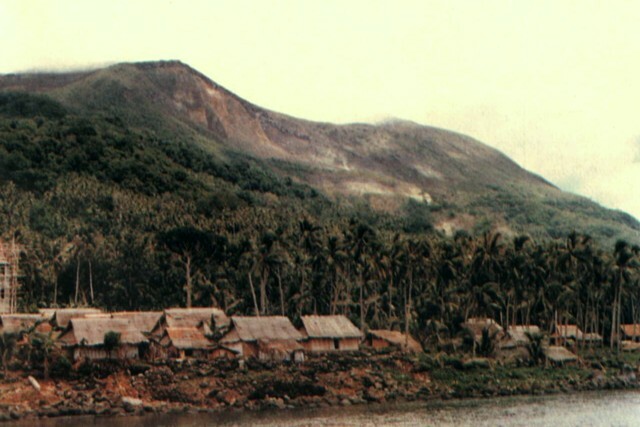 Gunung Wurlali volcano rises above Teluk Kuluwati village on its southern flank. The 868-m-high stratovolcano (also known as Damar) rises 3800 m above the Banda Sea floor. Photo by S. Siswowidjojo, 1978 (Volcanological Survey of Indonesia). There are no samples for Wurlali in the Smithsonian's NMNH Department of Mineral Sciences Rock and Ore collection. Large Eruptions of Wurlali Information about large Quaternary eruptions (VEI >= 4) is cataloged in the Large Magnitude Explosive Volcanic Eruptions (LaMEVE) database of the Volcano Global Risk Identification and Analysis Project (VOGRIPA).